Yes I am back in my room the week before we are officially supposed to go back. It was nice to chit chat with the office staff and catch up before I headed into my room. The whole school is being rewired to support more technology so the campus has been off limits all summer. I got into my room and it was nice and clean, but no electricity. I got to work rearranging the furniture which actually didn't take that long. Then I changed out my bulletin board borders and decided to get to work on my math manipulatives. This summer I have been reading Math Work Stations by Debbie Diller. Her first few chapters are about organizing and purging. So I pulled out all of my tubs and containers. Doesn't look so bad, except for those huge containers from Go Math! I have not had any place to store those and have just been shoving them under tables to get them out of the way. I decided to start with the base 10 blocks. I have two sets and I really didn't use both of the sets. I actually didn't use the yellow set at all last year. The green set from the Go Math tub are foam and not as noisy. There are also enough for each student to have their own set. There are way too many pieces though. I decided to break apart the sets and make it more convenient for my needs. I placed 5 hundreds 20 tens and 20 ones in each bag. I made 25 sets and placed them in one of the smaller tubs. It almost fits! I put the rest in the huge tub it was in. Then I just started opening boxes and purging items I had never even seen!! Yikes! Do you know how many plastic clocks I found that I have never even opened? I also found all these goodies from Everyday Math that I have not even opened after 9 years!! Now this is all I have left to go through and organize. I think I may need to just pick up a few more tubs like the smaller ones above to house the rest of my items. I can't believe how much junk I have accumulated over the years and how many things I have never even used. I thank Debbie Diller for making me clean out and get rid of wasted items. Hopefully a newer teacher might take some of my overflow. Otherwise I don't know what to do with it. I have such a hard time throwing things away! What would you do? I am able to send mine to a classroom in another country that has very few supplies. I know Julie it is a pain to pass it all out! I now have sets for each student!! I have been reading her book this summer too! I love anything and everything she has to say. ( I do her Literacy Work Stations in my room already.) Good luck with your purging, that is my work for next week. I started with her Literacy Workstations last year. I love her ideas! I purged a couple of years ago after changing grade levels and 17 years of teaching! I know exactly how you feel! Feels fabulous! Thanks for sharing your purging journey... BTW--your ceilings are beautiful--with a fan to boot! Is it sad that we feel like we need to hang on to everything! I am really glad I have the time to do it! I love Debbie Diller's books!!!! I have yet to sort thru my manipulatives. 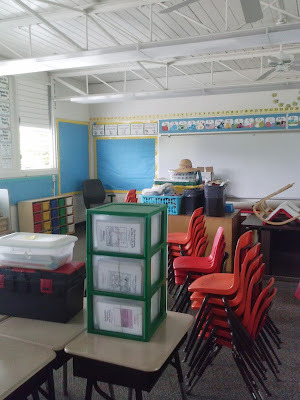 I am slowly working on organizing my classroom by taking a couple of hours each day. We do not start until after Labor Day so I have a bit of time yet. We also have EM, and I have some manipulatives we've never used, either...and I am pretty sure I am not skipping anything! I am also going to get rid of excess materials! Whew! Glad I wasn't skipping anything! I always say purging is good for the soul......you have been working hard ! I noticed your ceilings too, looks very tropical and cottagey, nice ! We have the same math materials! I need to do this as well! I tried doing some at the end of last year but we just got Go Math! so I'll have more stuff to sort through soon. :( Also I love that you have fans in your room! My school really needs that! If you get the materials for Go Math they are already sorted for you. Just break it down and sort it all out into smaller tubs. It will be so much easier!! Purging feels so good, doesn't it? 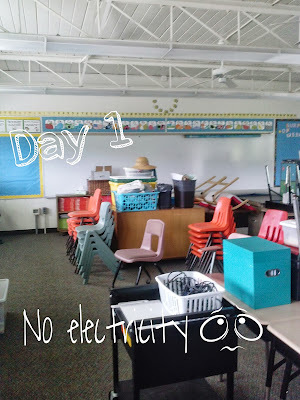 I did some purging the week after students were out in June and it felt wonderful! With regards to your extra stuff, if a new teacher doesn't want it, you might give it away as a prize to students! Isn't it amazing how much stuff we accumulate over the years? I love to go through things and get rid of stuff. Just hard to find time for it sometimes. Looks like you are making great progress! 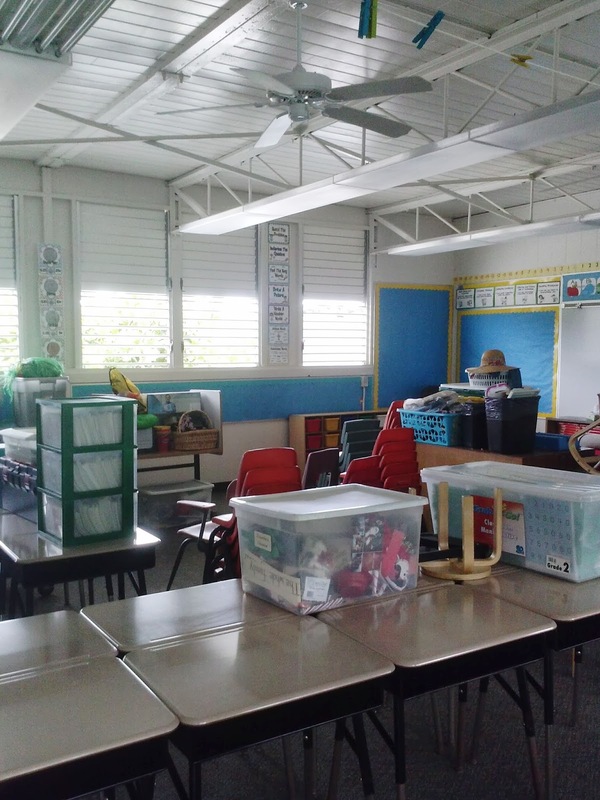 Are you in the same classroom this year? It's always a little faster when you are! Good luck getting everything organised! I've taken some of my supplies and stuff I dn't need/use to some of the schools in Kalihi/Waianae, etc...I know some of those schools have a lot of funding but some of them don't have very much at all....they were SO grateful! I am doing a surfing penguin theme this year - would you mind sharing where I could find/purchase your surfing/beachy penguin clipart? It is just perfect for what I am looking for! Just found out we are implementing Go Math this year and know nothing about it. I'd love to hear what you think. Your post is so timely for me. We are changing from Everyday Math to My Math this year. I had just gotten all of the EDM manipulatives organized last year,(my 3rd year using them). I thought I might need them although we were switching, so I too bought a copy of Math Work Stations to help plan. WE did not get any samples of our new math program and do not get our copies until the week before school begins. This past week I learned we get 2 large tubs of manipulatives with our new program. Now I am inundated with math "stuff" and feeling overwhelmed. Your post has really helped me take a deep breath and tell myself I can do it, too. Thanks!